So here it is, the final photo for the month of Flash of Red monochrome. Colour returns with the morning…….but it has been a blast. I have really enjoyed mono. Will be doing some more soon. 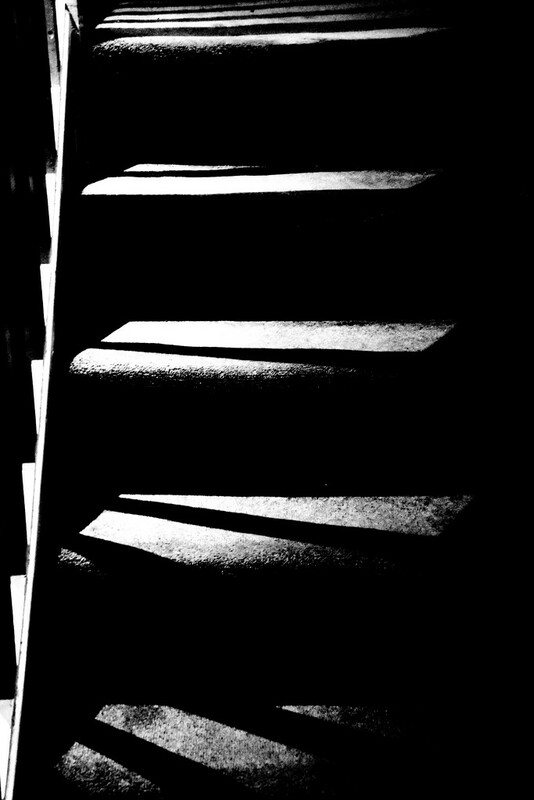 This is my staircase in my hallway with the light shining through the bannisters. A whole month collage on my Extras just for fun. I've loved your mono series, but looking forward to seeing some colour from you tomorrow. Lovely, lovely capture. Got through it:). I’m going to carry on shooting in camera raw Black & White so that I always have a colour image in the bank if I want it. Very cool series, photo and quote! Well done you have come up with so many interesting photos for this theme, although I am still in therapy after seeing the scarecrow photos. I love the contrast and the abstract look of this. Nice light and shade, well done for finishing, I think I would have struggled! Fab contrast, well done to finish the month. How's your husband motoring now? Great light/shadow work -- and an intriguing resulting image. Good news about your husband Casa, but bad news about your dental problems. That sounds absolutely awful, I'll keep all digits crossed that it's not cracked. Fixing that under a crown would not be fun, and very expensive. We're doing pretty well now thanks, all things considered. Currently having a very hot spell, 38 degrees today (c100F) and we were silly enough to play golf. Took lots of cold fluids, towels etc, etc, but Les started feeling sick after about 11 holes so we bailed out and came home. Both of us used to be OK in hot weather but I guess OA has caught up with us in that department. Damn. @casablanca If the weather is hot, and stays hot you do get used to it to some extent. Must take great care with fluids, hats, shade etc, etc. After all, people have to work in these temps, we chose to play. (There are now quite strict heat policies in most work-places, and even at the golf club. Yesterday, all play after 8.44am was cancelled, ie half the day's players in the 'afternoon' field. No carts allowed on the course once it's over about 35 degrees - fire danger - and anyone who chooses to play on foot is clearly informed that doing so is entirely their own responsibility.) Not like the poor devils I saw labouring on building sites in Dubai in mid-40s or worse. @golftragic Wow, how interesting. I guess that is the difference between western health and safety and the rest of the world. @casablanca Absolutely right. The labourers were, of course, all immigrants from the sub-continent, thus (a) desperate for money; and (b) easily replaced. Democracy may be flawed, but it's a heck of a lot better than the alternatives.